The Italian Army in Russia was an army-sized unit of the Italian Royal Army which fought on the Eastern Front during World War II. The ARMIR was also known as the 8th Italian Army and initially had 235,000 soldiers. 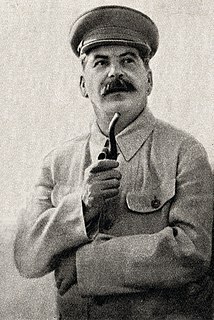 Joseph Vissarionovich Stalin was a Georgian Bolshevik revolutionary and Soviet politician who led the Soviet Union from the mid–1920s until 1953 as General Secretary of the Communist Party of the Soviet Union (1922–1952) and Premier (1941–1953). While initially presiding over a collective leadership as first among equals, he ultimately consolidated enough power to become the country's de facto dictator by the 1930s. A communist ideologically committed to the Leninist interpretation of Marxism, Stalin helped to formalise these ideas as Marxism–Leninism, while his own policies became known as Stalinism. Operation Saturn, revised as Operation Little Saturn, was a Red Army operation on the Eastern Front of World War II that led to battles in the North Caucasus and Donets Basin regions of the Soviet Union from December 1942 to February 1943. The Italian participation in the Eastern Front during World War II began after the launch of Operation Barbarossa, the German invasion of the Soviet Union, on 22 June 1941. To show solidarity with his Axis ally, Italian dictator Benito Mussolini ordered a contingent of the Italian Royal Army to be prepared for the Eastern Front and, by early July, an Italian force was in transport. A prisoner of war (POW) is a person, whether a combatant or a non-combatant, who is held in custody by a belligerent power during or immediately after an armed conflict. The earliest recorded usage of the phrase "prisoner of war" dates back to 1660. Giovanni Messe was an Italian general, politician, and field marshal. He is considered by many to have been the best Italian general of the Second World War. Stalag XI-B and Stalag XI-D / 357 were two German World War II prisoner-of-war camp (Stammlager) located just to the east of the town of Fallingbostel in Lower Saxony, in north-western Germany. Stalag IX-B was a German World War II prisoner-of-war camp located south-east of the town of Bad Orb in Hesse, Germany on the hill known as Wegscheideküppel. The camp originally was part of a military training area set up before World War I by the Prussian Army. Herman Reinecke was a German general and war criminal during the Nazi era. As head of the General Office of the Armed Forces in the OKW during World War II, he was responsible for the creation and implementation of the POW policy that resulted in the deaths of approx. 3.3 million Soviet prisoners of war. Reinecke was tried and convicted to life imprisonment at the High Command Trial. Stalag IV-B was one of the largest prisoner-of-war camps in Germany during World War II. Stalag is an abbreviation of the German Stammlager. 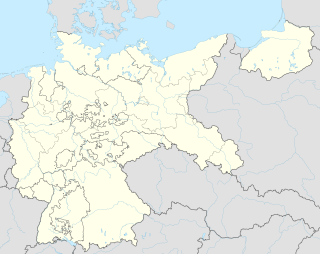 It was located 8 km (5.0 mi) north-east of the town of Mühlberg in the prussian Province of Saxony, just east of the Elbe river and about 30 mi (48 km) north of Dresden. From 1944 to 1945 it belonged to the Province of Halle-Merseburg. Now, the area is in Brandenburg. A sub-camp, sometimes identified as Stalag IV-B/Z,Stalag 304 or Stalag IV-H was located at Zeithain, 10 km (6.2 mi) to the south in Saxony. Stalag VII-A was Germany's largest prisoner-of-war camp during World War II, located just north of the town of Moosburg in southern Bavaria. The camp covered an area of 35 hectares. It served also as a transit camp through which prisoners, including officers, were processed on their way to other camps. At some time during the war, prisoners from every nation fighting against Germany passed through it. At the time of its liberation on 29 April 1945, there were about 80,000 prisoners in the camp, mostly from France and the Soviet Union. Many others were billeted in Arbeitskommando working in factories, repairing railroads or on farms. Systematic POW labor in the Soviet Union is associated primarily with the outcomes of World War II and covers the period of 1939-1956, from the official formation of the first POW camps, to the repatriation of the last POWs, from the Kwantung Army. By the end of World War II the number of Romanian prisoners of war in the Soviet Union was significant, about 140,000 of them having been taken prisoner even after August 23, 1944, the date when Romania switched its alliance from the Axis Powers to the Allies. 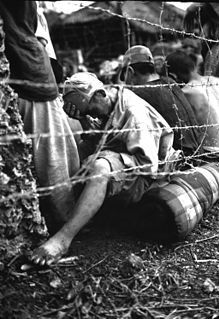 After World War II there were from 560,000 to 760,000 Japanese personnel in the Soviet Union and Mongolia interned to work in labor camps as POWs. Of them, it is estimated that between 60,000-347,000 died in captivity. 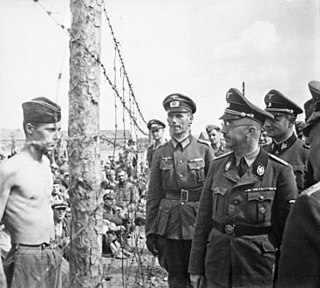 During World War II, Nazi Germany engaged in a policy of deliberate maltreatment of Soviet prisoners of war (POWs), in contrast to their treatment of British and American POWs. This resulted in some 3.3 to 3.5 million deaths. During World War II, the Italian Expeditionary Corps in Russia was a corps-sized expeditionary unit of the Regio Esercito that fought on the Eastern Front. In July 1942, the three divisions of the CSIR all became part of the Italian XXXV Army Corps. Richard Ruoff was a general in the Wehrmacht of Nazi Germany during World War II. He commanded the 4th Panzer Army and the 17th Army on the Eastern Front. There were two waves of the Finnish prisoners of war in the Soviet Union during World War II: POWs during the Winter War and the Continuation War. Benvenuto "Nuto" Revelli was an Italian essayist and partisan. 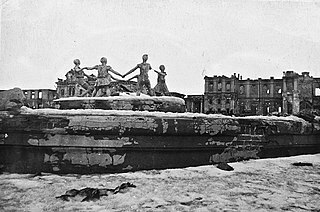 Soviet prisoners of war in Finland during World War II were captured in two Soviet-Finnish conflicts of that period: the Winter War and the Continuation War. The Finns took about 5,700 POWs during the Winter War, and due to the short length of the war they survived relatively well. However, during the Continuation War the Finns took 64,000 POWs, of whom almost 30 percent died.